This is an amazing set. 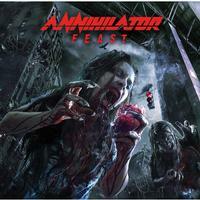 First, we get the newest Annihilator album, Feast. It’s a great set, as this band is always pretty great. If that wasn’t enough, though, next, this includes a bonus CD titled “Re-Kill.” It’s a collection of fifteen classic Annihilator songs redone. I’d almost say I like that disc better than the main one, but it’s kind of a toss up. They could have stopped there, but they didn’t. 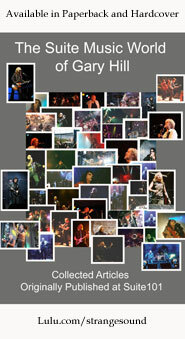 They also include a DVD of their Wacken performance from 2013. And, it’s all packaged in a deluxe digipack type case with a cool booklet. I can’t recommend this one enough. They waste no time here. This fires out of the gate with furious thrashy music. It’s a real powerhouse and a great way to start it all off in style. This starts off very much like progressive rock. In fact, it makes me think of King Crimson quite a bit. It turns out to another thrashing cut, but this one has some punk in the mix, too. It’s another screaming tune. They take it through a number of shifts and changes, but it never loses it ferocity. The earlier sections here make me think more of classic old school metal. It works out to more of the angry, furious thrashy stuff later, though. The bass opens this and it evolves into an almost funky jam. It feels more like King’s X than Annihilator. They punctuate that section with a real death metal segment, though. Then the whole thing gets more of a thrash vibe for a time. It goes back out to the King’s X movement from there and the whole sequence is restarted. There’s a mellower section mid-track that’s a little twisted. The guitar solo that fires out after that is purely incendiary. This is more of a raw punky thrash tune. It’s rock and roll meets metal. Other than some crunch at the end, this is basically a ballad. It would actually feel at home on a classic rock or even a progressive rock album. It’s quite melodic and very effective. It’s also a great break from the intensity. Speaking of intensity, this fires out evil sounding and ferocious. This is a pretty crazed number, working through some pretty unusual twists and turns. It’s also very tasty. At times it reminds me of Megadeth. The opening section on this one is more of a melodic, almost progressive rock jam. It’s quite effective. Then they fire out into more thrashing music from there. This is quite literally a screamer. The instrumental section later in the piece takes us in some unexpected directions and it gets pretty melodic. I absolutely love the opening section of this. It’s got a real balladic sound, but it’s more powered up than that. It’s melodic and quite tasty. The cut builds out gradually from there. This wouldn’t be out of place on a progressive metal album. It might not be all that out of place on a more modern metal band’s disc, either. Then around the two and a half minute mark, they tear out into more smoking hot thrash metal. Another twist occurs about three minutes later when they move it out to more melodic, but still hard rocking territory. There is some meaty guitar soloing that ensues. Then, around the six-minute mark we’re back into thrash. The melodic sounds get added to that after a time. Mellow, melodic sounds return to end it. What a cool tune this is. It’s got a prog metal vibe to it at times. At other points it’s almost like a twisted metal fun house, very fitting with the lyrics. This is a killer piece. It’s possibly one of my favorites from Annihilator. There are some shifts and turns here that are unusual. King Diamond seems a valid reference point here. This is another killer tune. I love the combination of horror metal and thrash. It’s a great tune. Although this isn’t as left field as the two openers, feeling more like what I expect from Annihilator, it’s got some exceptionally cool riffs. The guitar soloing is particularly noteworthy, too. A melodic section opens this. Then it shifts towards more metallic territory. It still retains that melodic vibe, though. After working through some changes, it drops to a more sedate section for the vocals. The cut has a real progressive metal vibe to it. As this evolves, parts of it have a real theatrical vibe. Other parts are quite thrashy. It works through bringing these various elements back here and there. It’s a very classy tune. This comes in very much like a progressive rock song. Then it shifts out to some pure thrash in a staccato pattern. As this continues to evolve, other parts of it are more proggy. It’s another great piece of music. Welcome To Your Death W.T.Y.D. I love the riff that drives this. Somehow it makes me think of a thrashier version of a Judas Priest riff. This is more pure metal than some of the stuff on this second disc. Still, they drop it down for a mellower section later in the piece. There is even some classically tinged guitar soloing in the piece. It works back out to the main metal stomper mode, though. Although this one is more mainstream than some of the stuff on this second disc, it’s also one of the stronger pieces here. It’s got some great riffs and hooks and just works really well. I love this song. Thrash! That is the order of business here. It’s much more extreme than anything else on this second disc. It’s a real screamer. This is angry, but also very tasty. I love the driving bass line at the start of this. It’s another with a lot more pure thrash built into it. There’s some killer guitar soloing in this beast, too. Although there are some mellower drop backs, this is a smoking hot metal stomper. It has more thrashy sections and more melodic ones. This is incredibly fast and incredibly ferocious. This is what thrash is supposed to be. At least this is more like what early thrash was like. It’s a monster. It’s definitely a highlight of the set for me. There’s a jam later in the track with a guitar solo that makes me think of the kind of thing Deep Purple would do if they were a thrash band. A science fiction metal stomper, this is another especially effective cut. There are some melodic, almost proggy moments here. There also seems to be a quote from a TV show’s theme music to my ears. The mellow, intricate section later is classy. The intro here is a little odd. It’s kind of like a weird fusion thrash thing. They fire out from there into more pure thrash, though and it’s great. There are some sections on this that make me think of Judas Priest, too. It’s another that shifts and turns pretty frequently. Thrash and old school metal seem to merge on this rather off-kilter (in a good way) number. It’s not really a standout, but that’s mostly because the rest of the disc is so strong. The mellower movements are classy, though. After an odd (but funny) little introduction, this fires out into some awesome jamming that’s part thrash and part progressive rock. After this section, though, it’s more straightforward mainstream metal for the verse. The chorus and jam afterward, though are twisted and thrashy. There’s some weirdness mid-track, too. At times it’s like Dr. Demento. At other times it’s like Frank Zappa.